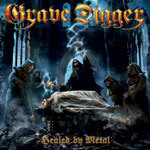 Grave Digger has a long tradition of releasing every other album really good and every other ranging from ok to quite mediocre. I am sad to say, and I have to let it out right away, that this album is among the most boring and flat they have ever done. Following the great album Return Of The Reaper from 2015 it is no surprise. There are of course highlights to be found here. Call For War which stylistically very easy could have fitted on the album Tunes Of War. The brilliant and catchy chorus in Free Forever. The main riff and chorus in Kill Ritual. The vocals. The great and crisp production. Apart from those moments I experience this to be a boring and dull album composed completely without passion. It rolls along uninspired, bland and seemingly without an engagement in the task. There is a lack of identity, a lack of character. The songs are short and compact and it feels like they hardly have started when they end. We get the occasional decent but generic riffs here and there, but the overall impression is dulled by the fact that many of them sound re-used from past songs, and even then they were not among the best riffs. It has to be pointed out that Chris Boltendahl, who I crown the star of this album, seems to be refining his vocals a bit more for every year that passes and he is really on his toes here. A great performance and the man seems to have many good years left in him. I consider this a hastily put together mishap and instead start to look forward to the next album. If they continue their clockwork steadiness it should be out sometime during the summer of 2018. And be significantly better than this.